Breakfast is the first meal of a day, some say the most important. The word in English refers to breaking the fasting period of the prior night. I don’t know about that, but sometimes I think there should be a middle of the night meal. I love breakfast and in Memphis we have all kinds. Here are five choices to start your day off on the right foot. The line starts at 5:00 a.m. at Bryant’s Breakfast for those who wake up extra early. Bryant’s has been around and making addictive biscuits since 1968. A cup of coffee and a country ham biscuit or their banana-strawberry pancakes would be a great start here. If you are closer to downtown around 6:oo a.m. Then Sunrise Memphis would be an excellent choice. This colorful oasis of breakfast offers an eclectic southern breakfast. Try a Chef’s Breakfast bowl ($8), that has fried eggs, sausage, and cinnamon toast chicharrones on a bed of cheddar grits, or perhaps P Love’s biscuit sammie ($5.50) with smoked bologna, american cheese, fried egg. They also make a mean Bloody Mary. RELATED CONTENT – A Bloody Mary with bacon and beef jerky? Yes, please! Brother Juniper’s — 3519 Walker Ave. Opening at 6:30 a.m. near the University of Memphis is Brother Juniper’s. Serving up hearty dishes like their Spanakopita Omelet ($9.95) with fresh spinach, feta, mozzarella cheese & green onions. You should also try the cinnamon roll pancakes ($8.95) swirled with cinnamon sugar and cream cheese icing might put you in a coma, so we suggest pairing this with a hot cup of coffee. Elwood’s Shack — 4523 Summer Ave.
Now if you are near Summer Avenue around 7 a.m. then Elwood’s Shack would be the place to be. Try Eggs Over MyHammy($10), a breakfast pizza with eggs over easy, ham, bacon & tomato or the Pimento Cheese Biscuit ($7), a fluffy sandwich with applewood bacon paired with vine ripened tomato and Elwood’s homemade pimento cheese. Now if you just can’t wait for morning to come, head to Gibson’s donuts. The almost 50 year old institution of glazed perfection is open 24 hours a day. The variety of mouthwatering, tummy loving fresh donuts is enough to make you feel like you’ve gone to donut heaven. Our personal fave is maple bacon. 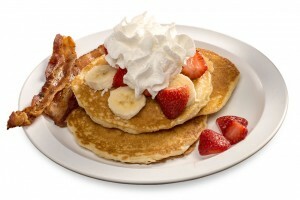 Where’s your favorite place to get breakfast in the Bluff City? Drop us a line and let us know where your favorite place is! Be sure to keep up with us on social media: Like us on Facebook, and follow us on Instagram. Sink your teeth into fall!